Heuchera micrantha Douglas ex Lindl. 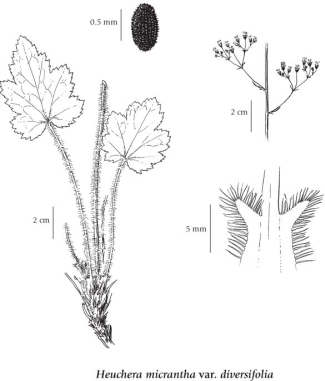 Perennial herb from well-developed, horizontal to ascending rhizomes, clothed with old, brown leaf-bases and stipules; stems 1 to several, erect, 15-60 cm tall, long soft-hairy below, strongly glandular-hairy in the inflorescence. Basal leaves kidney- to heart-egg-shaped, 3-8 cm wide, either shorter than wide with 5 to 7 rounded, shallow lobes, or longer than wide with pointy lobes cleft 1/3 their length, stiff-hairy below, sometimes also above, stalked, the stalks long, sparsely to densely hairy or rarely smooth; stem leaves 1 or 2, greatly reduced, the upper bract-like; stipules membranous, fused to the leaf-stalks. Inflorescence an open, many-flowered cluster, the branches and flower-stalks thread-like, the bracts linear; petals white, 5, 2- to 4-times longer than sepals, clawed, the claws slender, blades diamond- to spoon-shaped; calyces greenish-yellow, bell-shaped, long-soft-hairy, joined to ovary almost to top, the free hypanthium about 0.5 mm long; calyx lobes 5, oblong-egg-shaped, about 2/3 length of lower portion; stamens 5, longer than calyx lobes. Capsules, 5-6 mm long, egg-shaped, opening along the beaks; seeds deep brownish-purple, 0.6-0.7 mm long, with lengthwise rows of 25-30 spines. Moist to dry streambanks, rock crevices and talus slopes from the lowland to subalpine zones; infrequent in NW BC, frequent on Vancouver Island and the adjacent mainland; S to WA and CA. A shade-tolerant/intolerant, submontane to subalpine, Western North American forb distributed more in the Pacific than the Cordilleran region. Occurs in maritime to submaritime cool mesothermal climates on nitrogen-rich soils; its occurrence decreases with increasing elevation and continentality. Scattered in non-forested communities and open-canopy forests on water-shedding (colluvial) and water-receiving (seepage and stream-edge) sites. Characteristic of Moder and Mull humus forms. The climate type for this species, as reported in the: "British Columbia plant species codes and selected attributes. Version 6 Database" (Meidinger et al. 2008), is subalpine boreal & cool mesothermal.